Kennametal KenTip Modular Drill Promotion. Kennametal KenTip Modular Drill Promotion. 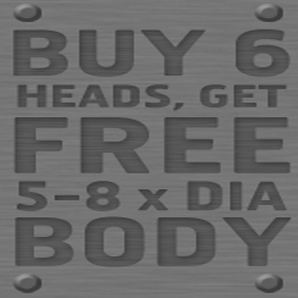 Purchase 6 KenTip drill heads and receive either a 3-5 or 8xD KenTip modular body free of charge. Multi size heads which relate to the seat size of the body are acceptable. Drill body value will be deducted at the check-out. This is an exclusive on-line offer.